Welcome to Core Set 2019 previews! I'm Ethan Fleischer. I led the design of Core Set 2019. I want to tell you about what's in the set and how we made it. What Is a Core Set? Core sets are Standard-legal booster releases that serve as the ideal first booster pack experience for players relatively new to Magic. Core sets have a secondary goal of providing sweet new cards and a different type of Limited experience for experienced players. Before I delve deeper into core set design, I'd like to introduce the teams who worked on Core Set 2019. Click below to learn about the talented people who brought this set to life. 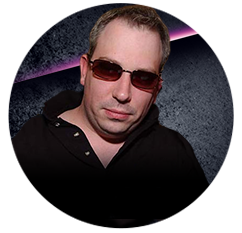 Doug is a principle designer for Magic creative. As longtime fans probably know, Doug is a veteran worldbuilder. What is perhaps less well known is that Doug is quite a good game designer as well; he was the lead designer of Magic 2013. Doug was a great help as we hammered out what story connections should appear in the form of cards in Core Set 2019. 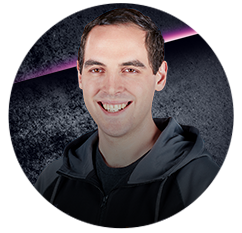 Bryan is the manager of the Play Design team, the group responsible for game balance and for ensuring that our formats are fun and healthy. Bryan lead the development teams for Archenemy: Nicol Bolas, Commander (2017 Edition), and Iconic Masters. Bryan has a good grasp of competitive Magic, game balance, and even card collation. Jackie no longer works at Wizards, but she was an associate game designer during M19 vision design. 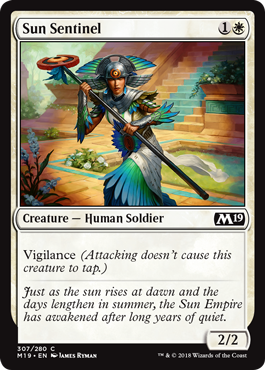 Jackie worked on several design and development teams, and I'd worked with her on Amonkhet recently before we started work on M19. 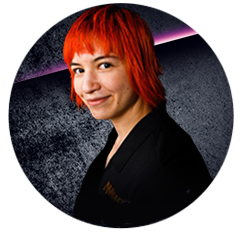 Jackie's focus on accessibility made her a great addition to the team, as one of our main goals for the core set is to bring new players to Magic. Dave also no longer works at Wizards. 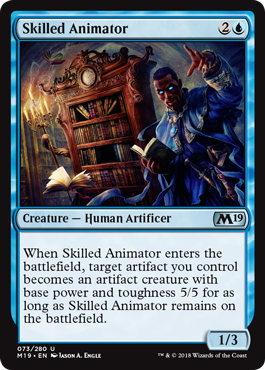 His main job during M19 vision design was as a senior UX designer for Magic: The Gathering Arena. Dave had worked in R&D for years prior to that, and he ran learn-to-play-Magic sessions for Wizards employees for most of those years. 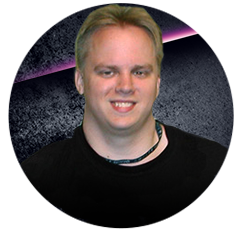 Dave's experience teaching hundreds of people to play Magic made him a tremendous asset to the team, as we could focus on things that work and avoid common pitfalls. Ken is a senior game designer in R&D, one who I'm always happy to have on a team. Ken lead the design of numerous sets, including Return to Ravnica, Ixalan, and the original Magic: The Gathering Commander product. 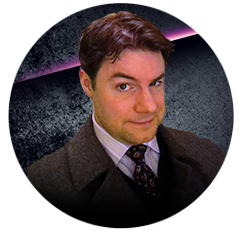 Ken is a powerhouse when it comes to designing cool, novel cards, and is great at solving higher-level problems that crop up. 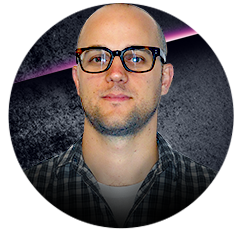 Yoni is also a senior game designer. 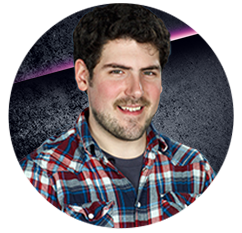 Yoni lead the development teams for Explorers of Ixalan and Masters 25. He has a good grasp of competitive Magic (he's practically a Play Design team member!) but also has a great design sensibility. I am also also a senior game designer. I have lead several projects, mostly focusing on the exploratory design and vision design ends of the process. 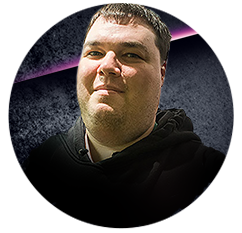 Corey is a designer working on Magic, but during M19 set design he was one of our R&D interns. Corey was a great help to us. 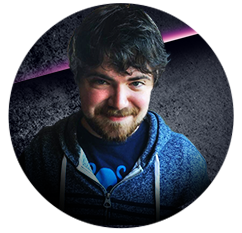 He designed the Deck Builder's Toolkit and designed and implemented some special playtests with inexperienced Magic players. Aaron is the senior director of Magic R&D, and as such is my boss's boss's boss. Aaron has a great ability to cut through to the essence of problems. He also has a really off-the-wall design sensibility and a predilection for Bat tokens. Aaron was keeping an eye on big-picture design issues for M19, and we had lots of discussions about set size, complexity, and the audiences we could serve. Ben is a principle designer working on secret projects in R&D. Ben has lots of experience leading Set Design teams, including those for Aether Revolt, Rivals of Ixalan, and Conspiracy: Take the Crown, so I relied on him to help me learn the ropes in my first set design lead. Ben had to leave the team partway through because of his commitments to said secret projects, but he was a great mentor to me while he was on my team. Mark is one of our product architects, who keep an eye on the big picture of how our various products relate to each other and interface with various teams that are involved in the process. They particularly work with the Brand team a lot. 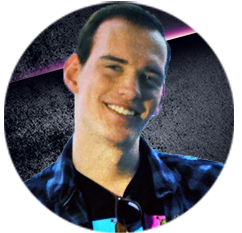 Mark was mostly on the team to learn about the design process to enhance his ability to do his job, but he submitted plenty of good card designs and contributed in various ways according to his strengths. 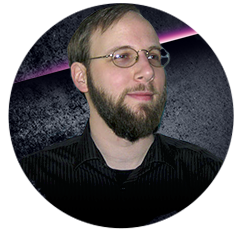 Adam is a game designer on the Play Design team. 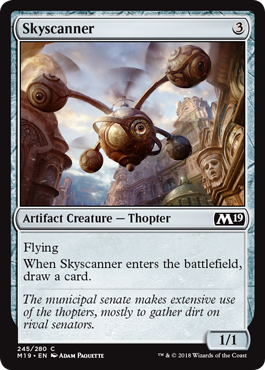 He joined the team as M19 entered the Future Future League (FFL), when we test the cards in our version of the future's Standard format. Adam has lead several product teams, including those for Eternal Masters, Modern Masters 2017 Edition, and Masters 25. Adam and I have been on each other's teams many times over the years, and we have a great rapport. 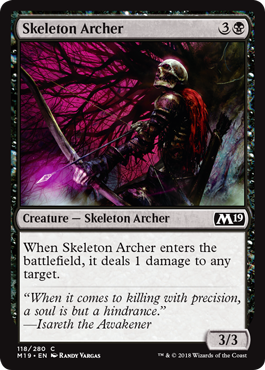 I worked with Adam constantly to integrate M19 into Standard. (Also on the Vision Design team) Yoni was nearly my partner on this project. His desk was right next to mine, so I was constantly discussing anything and everything about the set with him. (Also also on the Vision Design team) I lead both the vision and set designs, which I believe was unprecedented. This was my first time as a Set Design team lead, so I learned a lot! Magic is a great game. I happen to think it's the greatest game. I want to share the awesome things that Magic has given to me over the years with new players. However, the barriers for entry-level players are high. One of the biggest barriers is complexity. I'd be shocked to hear there's any game in history more complex than Magic. I love complex gameplay, and if you're a big enough Magic fan and reading this article, you probably do too. For the core set, we toned down that complexity in a few areas to make that learning curve a little less steep. We put a few more vanilla creatures in than we do in our regular sets. There aren't any non-evergreen keywords. And we even left out a few of the keywords that new players are less likely to need to know for their first few games. Understanding what each card does isn't the only type of complexity that players will encounter in a game. Board complexity, understanding how all the permanents on the battlefield interact, is another form of complexity that needs to be managed. 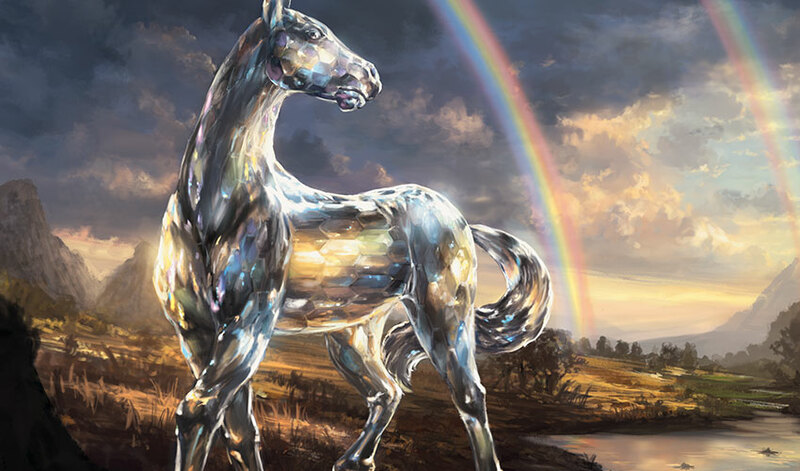 Modern-day Magic, with its very creature-centric focus, can sometimes lead to clogged battlefields with too many permanents to keep track of. 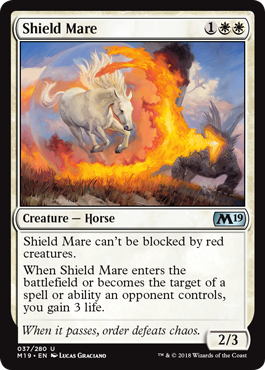 It may be difficult to figure out whether you can safely attack with your creatures, which can lead to even greater crowding of the battlefield. These overcrowded battlefields were of major concern to Jackie Lee, one of the designers who worked on the Vision Design team with me. She had done a lot of analyses of power-to-toughness ratios, number of permanents on the battlefield per game, and other factors that could influence board complexity. 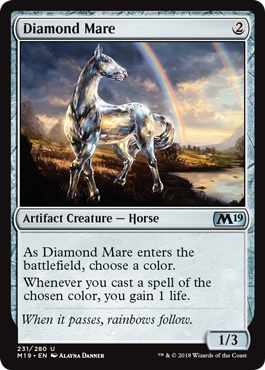 One of her suggestions for cards that would make it easier for players to determine if a creature could safely attack is the line of text, "[Card name] can't be blocked by [color] creatures." It's very easy to see what color each creature controlled by an opponent is, so you can quickly filter those creatures out when making your decision about whether to attack. I really liked the idea of making a cycle of creatures with this ability as an experiment. Of course, the desired complexity reduction wouldn't take place if players didn't actually use the creatures. A white creature with the rules text "[Card name] can't be blocked by red creatures" was never going to make it in Standard. We added an ability to each member of the cycle that would hose the enemy color in an appropriate way. 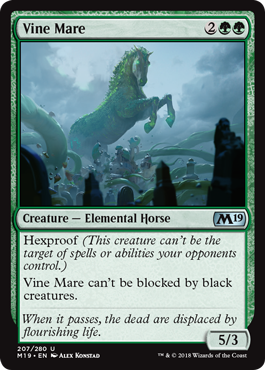 You may have already seen Vine Mare in the intro for the newest season of Spellslingers, but let's take a deeper look at the design now. Rewinding the clock a bit, during Dominaria vision design, Richard Garfield designed a lot of updates to early Magic cards, mostly cards from Limited Edition (Alpha). One of his designs that seemed very promising was a cycle of artifact creatures based on the "lucky charm" cycle. These types of cards have always been very popular among inexperienced players. Those players love gaining life, and they like cards that give them some clear deck-building direction. The problem with these cards is that they're very weak. A pure life gain spell is almost never worth spending a card on. Richard's solution was to put the same appealing effect on an otherwise serviceable artifact creature. Somehow, in all 25 years of Magic history, no one had thought of doing that. Now, I don't mind telling you that the art on this card was a bit controversial. Some said it pushed too far from Magic's typical style. Others loved it because it pushed the boundaries. But both sides agreed that it was the Magic art most likely to have appeared on a Trapper Keeper in 1988. Personally, I love it! Let's take a closer look! 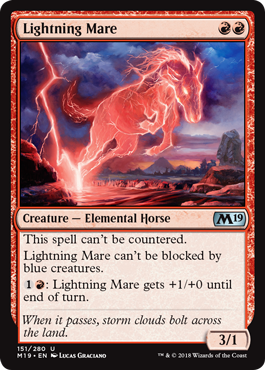 Man, with all these new Horses, is it Horse tribal's time to shine in Standard? A creature with haste teaches players about summoning sickness. A card with vigilance lets players know that creatures normally tap when they attack. "[Card name] can't be blocked by more than one creature" teaches players that multiple creatures may normally block a single attacker. All this simplicity and teaching isn't going to make anyone fall in love with Magic though. It's important that the core set demonstrate what's fun, exciting, and unique about our game. We need to blow peoples' minds and imply that the game is bigger than the cards they have in their initial collection, and that with the right combination, they could do something incredibly powerful! These combos should feel a little transgressive, like the player has discovered an exploit in a video game, an interaction that maybe the designers didn't anticipate. We seeded a few of these combos into the Planeswalker Decks. Once the rest of the set has been previewed, you'll encounter other, more powerful combos. Some of them we deliberately seeded, some of them, in fact, we did not anticipate. Good hunting! Another tool we used to make the core set more accessible was with resonant concepts and top-down designs. Even a card with a lot of words on it is easy to understand if it tells a familiar story. You'll see lots of classic fantasy tropes that you'll recognize from the novels, movies, and role-playing games of yore. We also took the opportunity to update Magic to reference tropes you won't find in the 1977 Advanced Dungeons & Dragons Monster Manual. To me, a Skeleton is an animated pile of bones from an old Ray Harryhausen movie. Knock the bones apart, and they reform again to menace our hero . . . But to my kids, a Skeleton lurks behind a tree with a bow and fires arrows from ambush. We captured this and a few other 21-century fantasy concepts in Core Set 2019. Life is hard. Magic is an escapist fantasy for many, a way to let go of the frustrations that life can bring and step into the role of a powerful wizard. It can be tremendously valuable for people to be able to see others like themselves in media. It's very welcoming. We stepped up our representation efforts, presenting characters of a variety of races, genders, and body types. This probably won't be very apparent to experienced players who primarily interact with new sets by looking at the Card Image Gallery or opening booster packs, but we've taken steps to ensure that players who encounter Magic through Welcome Decks and Planeswalker Decks will encounter a variety of characters. Core Set 2019 is part of a constellation of products designed to introduce new players to paper Magic play. Welcome Decks, Planeswalker Decks, the Deck Builder's Toolkit, and booster packs all speak to each other. Usually, we design the booster set, and the other products have to make do with whatever shakes out of the design process, which is often more focused on the needs of experienced drafters and Constructed players than it is on the needs of the other products. For the core set, we designed all of these products in tandem, allowing the needs of the Welcome Decks, for example to inform the Limited gameplay of the set. This gave the introductory products the tools they needed, but didn't compromise Limited's gameplay depth for experienced players. We knew that Core Set 2019 needed to offer plenty for experienced players as well. With simpler common cards and no new keyword mechanics introduced, we needed to find other ways to add depth and complexity to the set for Limited. Each color had a strong primary theme we could cross over into a secondary color. We layered in five other, subtler Limited archetypes that players could discover over time. To add spice, we put in many, many build-around cards that could influence players' pick orders. And finally, we added five three-color cards at mythic rare. These wouldn't show up every draft, but when they did, they would encourage the player who drafted them to make a different deck than they would otherwise. Making cards for Standard is somewhat of a challenge for a summer set. Standard is never larger than it is when the summer set is released. 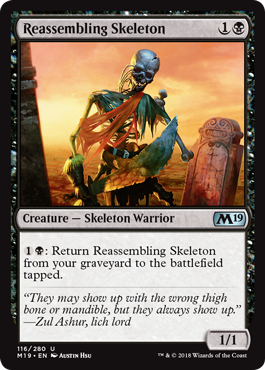 There was certainly little hope of introducing a whole new deck into the format that uses mostly cards from M19. In general, it's more effective to position new cards to fit into decks that were almost, but not quite, strong enough for Standard. 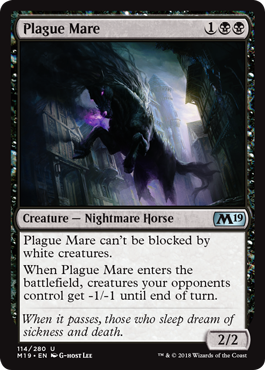 We can also introduce cards that depress decks that are particularly powerful in Standard (or at least, decks that were particularly powerful several months ago, when M19 was finished). We also found opportunities to connect a few powerful cards that were seeing play separately into new kinds of decks. You may notice a few particularly odd-looking rare cards in the set. These may very well have been designed with Modern in mind. Our thinking is this: if this set is going to have somewhat of an uphill battle making an impact in Standard, we should devote some space to other formats to make up for it. Anyone who knows me even a little bit knows how much I love Commander. The queen of all formats gets plenty of love in Core Set 2019. We started off with five monocolor legends, each mechanically associated with the color's main theme in the set. We also designed a cycle of three-color legendary creatures that were top-down designs based on the characters they represent. More on that below. 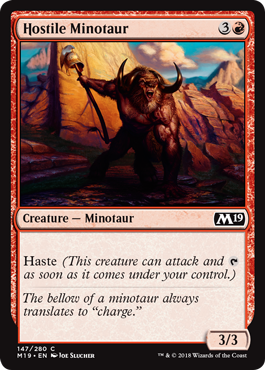 Magic's newest format, Brawl, hadn't been born yet when we designed M19, so we weren't planning the set with Brawl in mind. 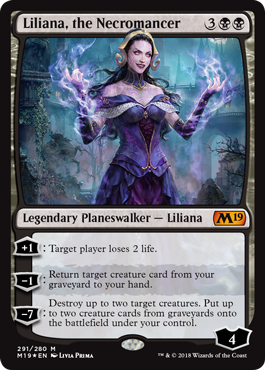 By lucky chance, Brawl gets a whopping 20 new commanders—half of them planeswalkers—with Core Set 2019! 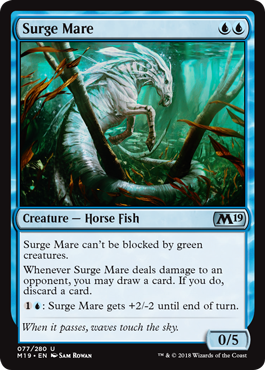 Before Core Set 2019 was Core Set 2019, we had scheduled a small set in the Dominaria block, codenamed "Salad," for summer 2018. We decided to change our plans a few weeks into the Salad design process. For more information about why we made the change, see Mark Rosewater's article. Before the switchover, while Dominaria story planning was still ongoing, I was concerned. We were in the middle of a major story arc centered on one of our most important villains. I was concerned that Nicol Bolas was too much of a one-dimensional moustache twirler. He had kept popping in and out of the story over the last decade or so, doing something evil, and then disappearing. Was it even clear to the audience that Bolas had a grand scheme? I kept bugging the Story team, "Hey, we should get some background info on Bolas in the Dominaria story." 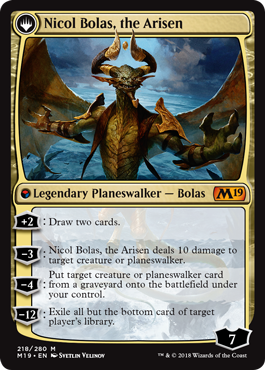 For a while, it looked like maybe they would be able to have Tetsuko Umezawa, or Ajani Goldmane, or someone relate Bolas's backstory to the Gatewatch (and the audience) help explain the Elder Dragon's motivations and his plan. But Dominaria's story was a complex one, and ultimately the needs of Liliana's arc took precedence, so it was looking unlikely that Bolas would get his backstory. We decided early on in M19 vision design that we wanted to make five monocolor Planeswalker Decks. I wanted to tie each of the Planeswalker characters to Nicol Bolas's evil schemes in some way. We planned it out thusly. 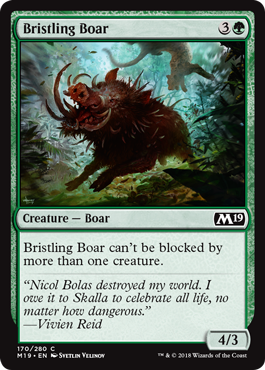 Ajani had fought against Nicol Bolas during the Shards of Alara block. Bolas had instigated a massive war on Alara and fed on the mana released by that massive conflict. 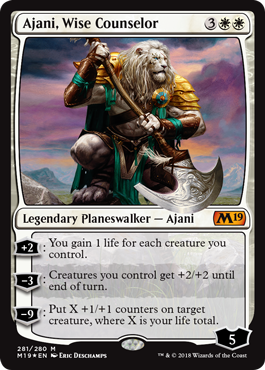 Ajani was able to prevent him from regaining the full measure of his former godlike power by summoning an avatar to battle Bolas to a standstill. Ajani's strategy supports an army of small creatures with a dash of life gain for spice. 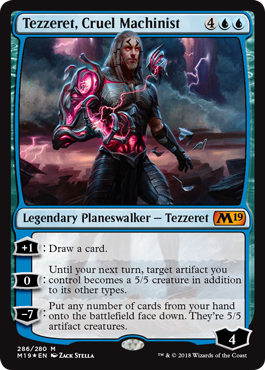 Tezzeret has long been a minion of Bolas. Recently he has stolen more than one powerful artifact that will be important in the upcoming story. We eventually decided to focus on Tezzeret's theft of the Planar Bridge from Kaladesh. He incorporated the bridge into his own body. Tezzeret's strategy supports an artifact-based deck. Liliana has been a sometime minion, sometime foe of Bolas. He brokered her contract with four powerful demons. Unbeknownst to Liliana, her contract defaulted to Bolas if all four of the demons died. Bolas has plans for her, oh yes. Liliana's strategy supports a control deck that gains card advantage by recurring creatures from the graveyard. 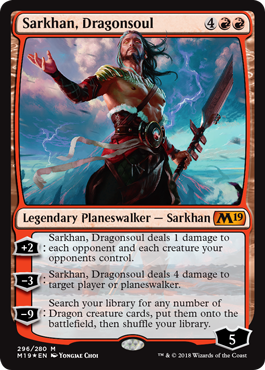 Sarkhan is obsessed with the predatory majesty of dragons. He fell into Bolas's orbit, believing him to be the ultimate example of dragonkind. Bolas sent him to Zendikar, hoping to instigate the release of those cosmic horrors, the Eldrazi, from their prison there. Bolas needed a team of heroic Planeswalkers as an element of his plan, and every group needs a first adventure to mold them into a team. A battle against the Eldrazi was the perfect scenario to form the Gatewatch. Sarkhan's strategy is Dragon tribal! Things were going great until we got to green. We simply didn't have very many mono-green Planeswalkers. Garruk has been laboring under the curse of the Chain Veil for years now. We had tried bringing him back as a mono-green card in Magic 2014's Garruk, Caller of Beasts, and the audience reacted with confusion. "Is Garruk still cursed? What's going on?" Besides, Garruk had no story connection to Bolas at all. Nissa didn't have a very compelling story connection to Bolas. Jiang Yanggu was still being worked on for Global Series: Jiang Yanggu & Mu Yanling, and we didn't want to entangle our process with that of the team working on that product. Freyalise was dead, and she didn't have any story connection to Bolas either. We didn't feel comfortable making mono-green versions of any of our multicolored characters who had green in their colors. It became clear that, if we were going to make a core set every year, and that each core set would have five monocolor planeswalkers in it, and we didn't want to make the same characters over and over again, we would need to increase our stable of monocolor Planeswalker characters. This gave us the freedom to design a character with the power suite we wanted and give her the coolest creative treatment we could come up with to then write a backstory for her that made her an antagonist of Bolas. 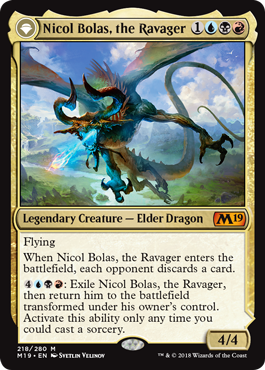 We won't be detailing that backstory in the near future, but here's the short version: Nicol Bolas destroyed Vivien's home plane of Skalla. Vivien managed to save the spirits of the animals of Skalla in a powerful artifact, the Arkbow. She can summon these spirits into battle by firing arrows at her foes. 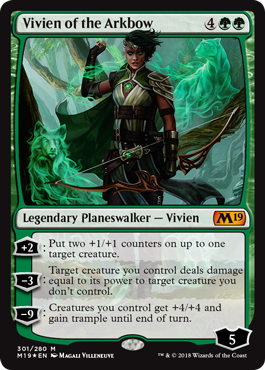 Vivien's strategy is to ramp into big creatures. As you can see, some of these strategies (go wide, ramp into creatures, graveyard recursion) are core to their colors' identities, while others (Dragons, artifacts) are a little weirder and closer to the fringe of their colors' identities. By mixing up the Planeswalker lineup and the deck themes, we can make future core sets unique without resorting to added complexity and additional keyword mechanics. 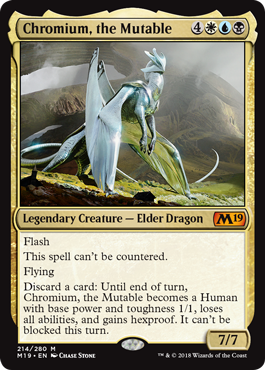 In M19 booster packs, you'll find leaner, meaner versions of all five of these planeswalkers, cards that allude to their rolls in Bolas's story, and cards that show important moments in Bolas's past that inform his current motivations. After adding all of this stuff to the set, I felt like something was still missing. Bolas was truly ancient, both in-story and in-game. All of our allusions were to events that happened within the last 60 years in the story, and within the last eleven or so years in the real world. We needed to go back to the beginning, to Nicol Bolas's childhood. Nicol Bolas first appeared in Legends, one of Magic's earliest expansions. He was part of a cycle of Elder Dragon Legends. These cards were amazingly cool when they were released in 1994, but they seem a little . . . inefficient . . . by today's standards. I decided to make updated versions. Many people contributed designs, and we went through many versions. After a while, I got a request from the Future Future League to redesign Chromium to be a finisher for an Esper control deck. I rolled up my sleeves and tackled that one personally. Just a few little tidbits of a more personal nature before I send you on your way. I had originally been slated to lead the Salad Set Design team. As a reminder, set design is the last phase of design, where the cards are refined and balanced against each other. The really nitty-gritty detail stuff. The cards are concepted and illustrated during this time, and eventually the set is handed off to editing for finalization. I had never led a Set Design team (or a Development team, as we called it under the old system). When we decided to scrap Salad and make a core set instead, I led a brief (around three-week) Vision Design team, followed by a Set Design team of pretty much normal length. This was very unusual. Generally, we don't allow the leader of the Vision Design team to lead the Set Design team. The whole process was a tremendous learning experience for me. I really dug into game balance, working with the Editing, Worldbuilding, and Play Design teams. I really feel like I leveled up and came into my own as a designer while working on this project. I now have a skillset that is distinct from that of anyone else in R&D. Due to some scheduling problems, I ended up leading three teams at once for a few weeks. Vision design for an ancillary booster set began, and "Baseball" exploratory design began, while we were still putting the finishing touches on M19 design. I developed an involuntary eye twitch during those weeks, but I like to think that I kept it together otherwise. Tough: that's me! In Japanese, "Vaevictis Asmadi" was translated as if "Vaevictis" were a title. So, the original Legends card Vaevictis Asmadi was translated into Japanese such that the word "Vaevictis" was a title, not a name. Our new card's name, Vaevictis, the Dire, wouldn't make sense to the Japanese audience. So, Allison changed the card's name to Vaevictis Asmadi, the Dire. Anyway, just a little behind-the-scenes look at the kinds of things I bet you never thought we had to keep on our radar. Enjoy the Rest of the Previews! I really think that we took great strides in making a paper Magic experience that serves as an introduction to Magic. Then we crammed as many cool cards as we could fit into the rest of the set. Have fun playing some good old-fashioned Magic at the Prerelease!